Beyond the legal requirements, OKCU is a faith-based University, embracing the traditions of the United Methodist Church. The rigorous curriculum focuses on Student’s intellectual, moral and spiritual development to prepare each student to become effective leaders in service to their communities. Oklahoma City University approaches alcohol and other drug abuse with compassion. Guidance is direct, firm, and supportive with proactive programs in place to educate students and employees. Oklahoma City University does not allow possession, use, distribution, or sale of alcohol and drugs on campus, at University-sponsored events, or off-campus. Students found responsible of violating the policy will be subject to disciplinary sanctions. The rules, regulations, and related sanctions governing these expectations are available in the University Alcohol and other Drugs Policy (pertaining to students). A copy is attached to this review. The Human Resources Department has established policies regarding drug and alcohol use for employees, in accordance to federal regulations. Please refer to policies 7.01 and 7.02 contained in the online OKCU Staff Handbook. Every new employee also receives information on the Drug Free Schools Act through employee orientation sessions. Universal Prevention Offered to everyone regardless to the presence or absence of risk factors: A) New students are required to complete an online education module (on-line screener) prior to the beginning of the Fall Semester. This provides insight about those students/student groups who are at high risk of engaging in risky behaviors. B) Incoming first-year students and transfer students participate in education modules on alcohol and other drug policies, campus safety, sexual and dating violence, and harassment. Sessions are available for parents as well. C) All first-year students attend a mandatory educational session during Stars Week (Orientation) each fall. D) University staff and student groups sponsored educational programs that aim to educate students on the use and abuse of alcohol and other controlled substances. Selective Prevention Activities targeted toward students or groups recommended through the online screener mentioned above. The University may require these students attendance to forums and guest speaking engagements centered around substance abuse prevention. Further screenings with a counselor regarding at-risk behaviors may also be required. Indicated Prevention Directed at students who are identified through behavioral intervention or treatment and will remain on case management status for the academic year, with recommendations for the ensuing academic school year to be determined by the appropriate staff. This is a form of post-intervention and encourages students to make healthy choices, follow treatment or counseling recommendations, and help deter future risk behaviors. It will helps quickly direct those students back to appropriate staff in instances of relapse. Parents and/or Guardians Parents are valued partners in the educational process and provide a strong foundation for prevention. During each Stars 101 (enrollment day) events, parents of prospect students attend an educational session at which Student Affairs’ staff discuss alcohol and other drugs on-campus, as well as the student conduct process. Parents of first-year student participate in Parent & Family Information Sessions during Orientation week. Parents receive mail-outs, emails, and social media updates on topics such as positive family support, healthy alternatives to stress, and communicating with emerging adults. The focus is to help parents communicate effectively and facilitate healthy life transitions. In keeping with a prevention-based foundation, Oklahoma City University will align itself with a Screening, Brief Intervention, and Referral to Treatment (SBIRT) model. “Screening tests are a first-line defense in the prevention of disease” (NIAAA, 2005). Every first-year and incoming transfer student will be required to complete a pre-orientation online education module on alcohol and other drugs, by the first day of classes. If not completed by that time, a grade hold will be placed on the student’s account until the modules are completed. Additionally, the student may be charged with a violation of the Student Code of Conduct. All screening activities will take place in a confidential setting and results will be treated as confidential information. Students identified as at-risk for potential addiction-related behavior will be referred to the University Counseling Center (UCC) for brief intervention (BI). A comprehensive list of substance abuse agencies in the community will be made available to all of those who are regarded as high at-risk as determined by the results of the UCC BI. 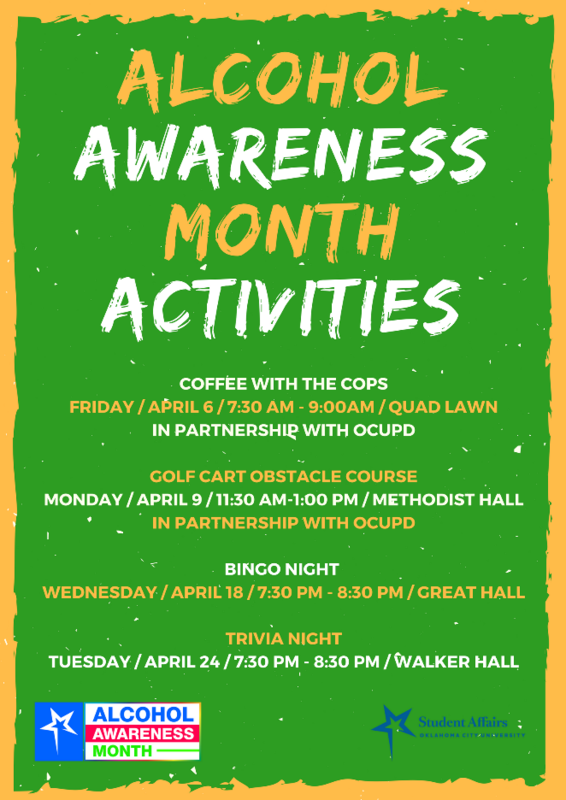 In this document, and for the purposes of the OKCU Prevention Program, use is defined as the use, abuse, of drug or alcohol by students but they are not dependent on the substance. Addiction is the use of drugs and alcohol with a dependency on them regardless of consequences. University Counseling provides educational programming accessible to students. Brief Intervention (BI) is provided at low cost on campus. Students under the age of 18 can self-refer to BI or are recommended by faculty/staff, policy infractions, and parents. Students over 18 are encouraged to contact University Counseling and set up their own appointment. The assessment tool currently used is the Substance Abuse Subtle Screening Inventory. Students who exhibit addictive behaviors have the option of attending treatment. A free referral to substance abuse treatment is provided to the student whose assessment results indicate a higher level of care. Counseling will refer them to treatment but will not recommend specific facilities. A list of accredited agencies in the area is available for the student to choose. This releases the university from any liability concerns stemming from the treatment modalities utilized. If needed, the Family Educational Rights and Privacy Act (FERPA) permits Institutions of Higher Education to notify parents of students who are under the age of 21 about the student violation of the use or possession of alcohol and controlled substances. While the major thrust of Oklahoma City University is drug education and prevention, the University takes take appropriate disciplinary actions on violations to its alcohol and controlled substances policies. This is to foster and provide a drug free environment in which students may grow intellectually and socially. Details on sanctions for violations to the Alcohol and other Drugs Policy are found in section 5 of the policy. The Chief Conduct Officers is responsible for securing that students have completed their sanctions and of imposing further sanctions, up to and including expulsion, if needed. A sample of the student conduct process checklist used at every conduct hearing is available in Appendix C.
According to student conduct records (summarized in the table below), 73.3% percent of all conduct hearings and charges, between 2016-2017 and the 2017-2018 academic years, were Alcohol and other Drugs incidents. Change the schedule of the Alcohol and Drug use survey on campus from annual to once per term (Spring/Fall). 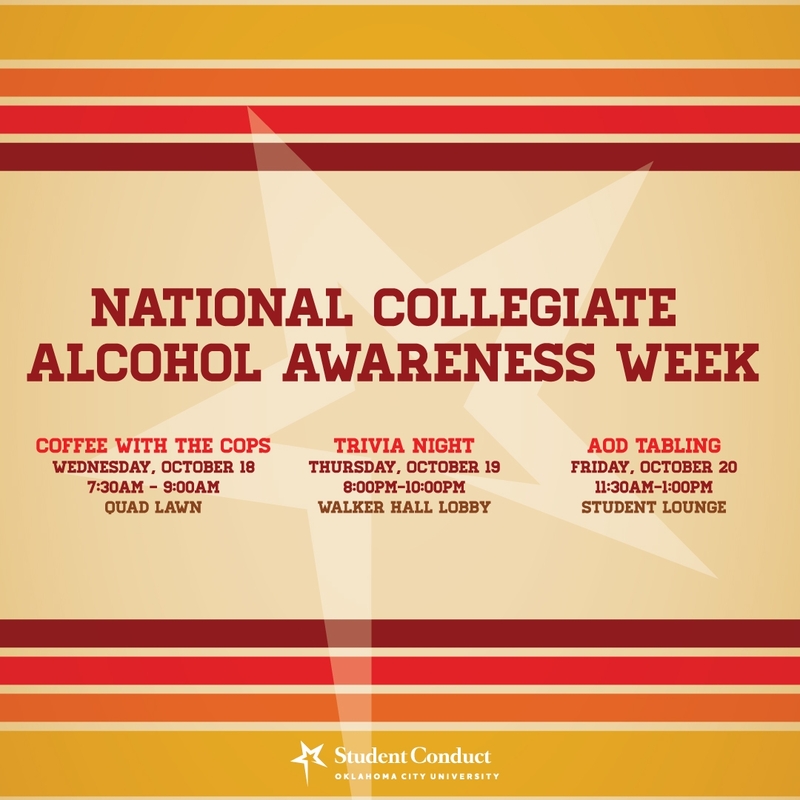 This constant influx of data will help improve alcohol and drug education and prevention on campus. Continue to provide AoD Programing that focus on alcohol abuse while enhancing efforts to address marijuana and prescription drug abuse. Continue to change the culture of AoD among college students in addition to prevention, intervention, and harm reduction. Integrate education and prevention programming through university activities and committees. Use the Parent’s and Family Newsletter to share information on alcohol and drug use and prevention. I have read and been informed about the Oklahoma City University’s Alcohol and other Drug Policy [click here to access the policy] I further understand that the Vice President for Student Affairs and Dean of Students is authorized to require those students who he/she has reasonable grounds to believe are improperly using or possessing controlled substances in violation of the University’s Drug Use policy to participate in the drug screening program. This electronic communication is sent to all students at the beginning of the academic year. It is also sent to all new and transfer students that are registered midway through the academic year at the beginning of the Spring term.